The regularity and richness of the annual Nile River flood, coupled with semi-isolation provided by deserts to the east and west, allowed for the development of one of the world's great civilizations. 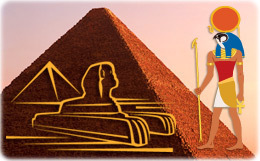 A unified kingdom arose circa 3200 B.C., and a series of dynasties ruled in Egypt for the next three millennia. The last native dynasty fell to the Persians in 341 B.C., who in turn were replaced by the Greeks, Romans, and Byzantines. It was the Arabs who introduced Islam and the Arabic language in the 7th century and who ruled for the next six centuries. A local military caste, the Mamluks took control about 1250 and continued to govern after the conquest of Egypt by the Ottoman Turks in 1517. Following the completion of the Suez Canal in 1869, Egypt became an important world transportation hub, but also fell heavily into debt. Ostensibly to protect its investments, Britain seized control of Egypt's government in 1882, but nominal allegiance to the Ottoman Empire continued until 1914. Partially independent from the UK in 1922, Egypt acquired full sovereignty with the overthrow of the British-backed monarchy in 1952. The completion of the Aswan High Dam in 1971 and the resultant Lake Nasser have altered the time-honored place of the Nile River in the agriculture and ecology of Egypt. A rapidly growing population (the largest in the Arab world), limited arable land, and dependence on the Nile all continue to overtax resources and stress society. The government has struggled to meet the demands of Egypt's growing population through economic reform and massive investment in communications and physical infrastructure (Source: CIA - The World Factbook). More: Images and a map of Egypt. The Great Sphinx at Giza - A colossal monument, sculptured in rock, representing a figure of the Egyptian mythology with body of lion and human head. It is 17 meters high and 39 meters of total length. 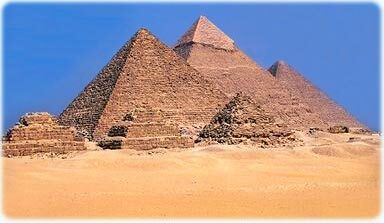 It was constructed in the reign of Khafre, about 2465 B.C. The Great Pyramids at Giza - the pyramids of Cheops, Chephren and Mycerinus were royal tombs, erected after 2780 B.C., in the old Egyptian empire. The Great Pyramid of Cheops (the one in the middle of the photo) is 138 meters high and has more than 6 million tons of stones. It was considered, by the ancient Greeks, as one of the Seven Wonders of the world. The only of the Wonders that survived until our days. 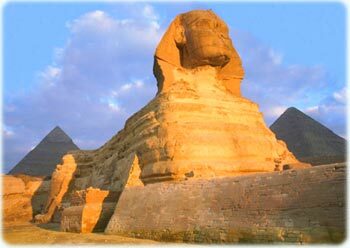 Copyright © Geographic Guide - History, Great Pyramids and Sphinx at Giza, Africa. View of Cairo and the Nile river.